Ellen Abraham is a former Social Studies teacher who now works in front of a canvas instead of a classroom. She is, however, still very much concerned with “social studies” as a subject for her art. Kathleen Vaccaro, reviewer for The Art Blog, describes her work: “Ellen Abraham’s large oil paintings, drawings and sketchbooks portray everyday scenes of bars, the subway and city life. Like artists of an earlier era, Toulouse-Lautrec, Max Beckman and Otto Dix, for example, Abraham’s exaggerated figures and flattened pictorial spaces attempt to capture the gestalt of today. Abraham is phenomenal in depicting gestures that sum up her characters. While she’s not doing portraits, her archetypal depictions have the verity of Kirchner. Satire and humor are at the forefront of her work”. Ellen obtained her M.F.A. degree from the Pennsylvania Academy of the Fine Arts. She has shown widely throughout the east coast region including the Sales/Rental Gallery at the Philadelphia Museum of Art, the Fellowship of the Pennsylvania Academy of the Fine Arts in Yellow Springs, PA, the Projects Gallery in Miami, FL, the Brooklyn Art Library Fiction Project, the Widener University Art Gallery and the Art Gallery at Gloucester County College. 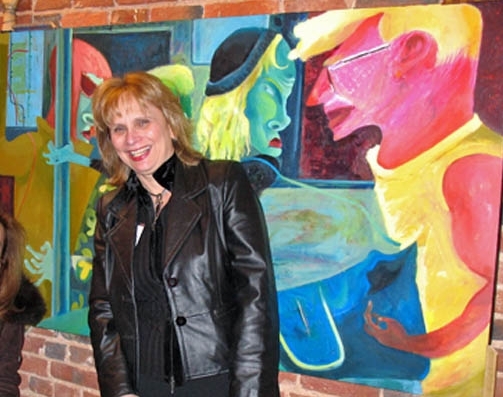 Her work has been featured in The Art Blog, the Philadelphia Inquirer, More Magazine, Philadelphia Weekly, Chutzpah Magazine, Professional Artist Magazine, the Main Line Times, the New Jersey Courier Post, the Jewish Exponent, the City Suburban News, the Ambler Enterprise, Grid Magazine, the Roxborough Review, Philadelphia City Paper, Art Calendar and Art Matters. She was recently selected as a semi-finalist for CFEVA's summer exhibition by Diana Nawi, a curator at the Perez Art Museum in Miami. Ellen is president emeritus of ARTsisters, an organization of professional female artists, who empower their communities through charity and art. She is also a Professional Artist Member of the Main Line Art Center and an artist at the Da Vinci Art Alliance. Ellen’s art is a hybrid of the figurative and the abstract.The satire and cartoon imagery of her youthful artwork began to evolve as she grew more familiar with German Expressionism, American Social Realism and Abstract Expressionism. The sketches of people drawn from life that she does daily provide constant fodder for her humorous paintings, drawings and prints. Her work is a synthesis of humor and fine art. She is quite serious about being silly. Her goal is to create art that is sown from the depths of comic outrageousness, satirical observation and mild misanthropy. If Matisse had the “sun in his belly," Ellen has a banana peel permanently attached to her shoe!